This is a must to check out. An amazing minecraft build by DiomondBlock. This is a 1:1 scale replica! Yeah you did just read that right. Below you can view the screenshots along with the authors description. Now to go book my own cruise. There is now an official minecraft vacation destination for your avatar! Don’t forget to try the squid! The only thing I don’t see in the screenshots are villages to make it look just a little more authentic! Other then that its well, perfect. Welcome aboard the beautiful Freedom Of The Seas! You will embark on a glorious journey across the seas! This ship was the longest project I’ve ever built. 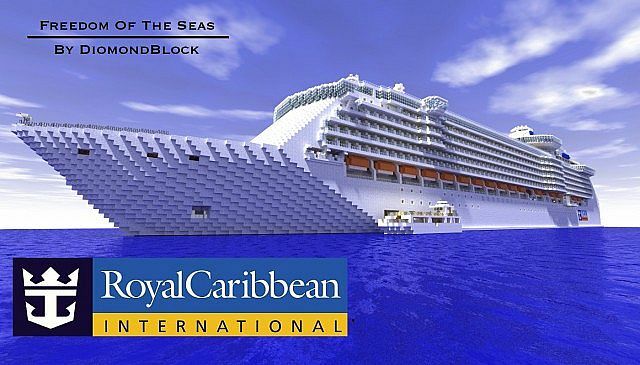 There are about 2 to 3 million blocks used in this ship. The Freedom Of The Seas was launched in 2006 and does 7 day cruises to the Caribbean. This was also the hardest ship I’ve ever made. It took almost 4 months. Please enjoy the ship. Have fun on this glamorous ship! Please diamond the ship if you enjoy it. Much effort was put into this ship. Without these people, I couldn’t have made this.